On the last day of our trip to the Philippines, we had planned on visiting the subterranean river of Puerto Princesa. Opposite to what its name indicates, it is really in Sabang, about 2 hours van ride from the main city. But the tickets can only be bought in Puerto and the trip is almost impossible to arrange independently, especially in high season, so we signed up for an organized tour. Our stay in El Nido was quite frustrating. We had very high hopes for this place, and if you google images of it you’ll understand why. For 4 days, we tried to explore the lagoons, coves, coral reefs and caves of the Bacuit Bay islands, and we couldn’t. The coast guard wouldn’t allow any boats to sail due to a small typhoon that was crossing the area generating strong waves. 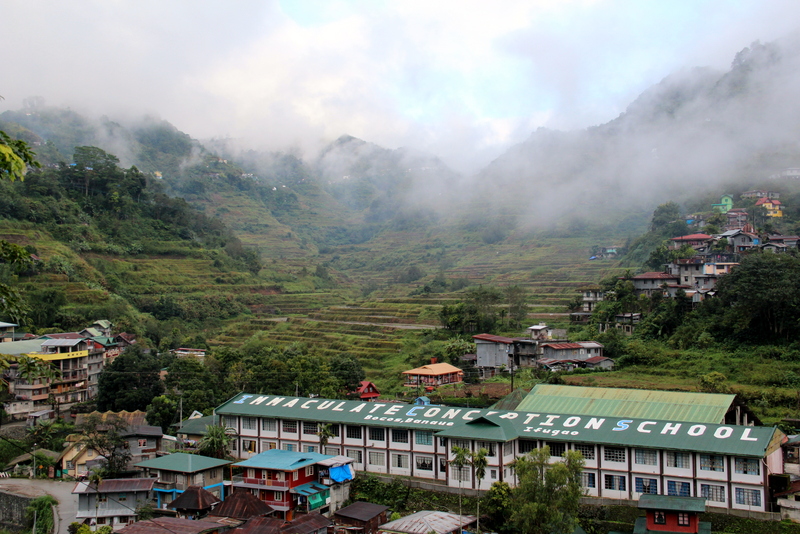 We arrived in Banaue by Ohayami bus at 5am, when it was still dark and rather cold. A kid offered to take us to a guesthouse and we followed him… got a double room at the People’s Lodge, in the center of the town, for 800 PHP ($17), and quickly passed out. At 7am we woke up and enjoyed the Banaue views for the first time: a mesmerizing green valley covered by rice terraces, carved by the Ifugao people 2,000 years ago. 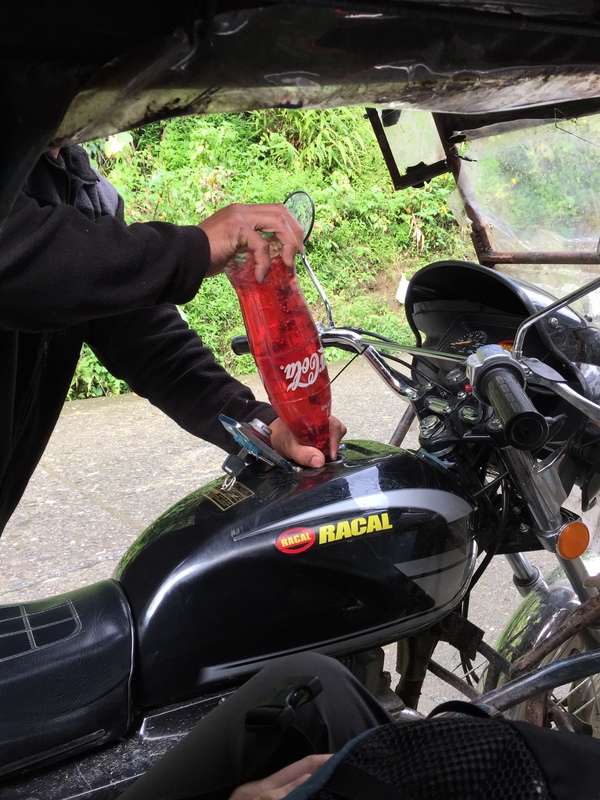 After a quick breakfast, we walked to the main square and hired a tricycle (which apparently works on coke ;P) to take us to the top of the mountain, the so-called Banaue viewpoint. Most people drive the tricycle up and down, but we wanted to be dropped off and hike down on our own. As we got higher, the fog wrapped us to the point that we weren’t able to see much of the rice terraces. But as we were trying to figure out the trailhead, the fog started to dissipate and we were able to see not only the paddies, but even a section of the ‘trail’ we intended to follow.